And a hush fell over the crowd. Seduction, mystery, deliverance, redemption. And I'm just talking about one song, "West Monroe." In an even slightly more illumined world, this artist is huge. And more illumined people should all have her records in their collections. 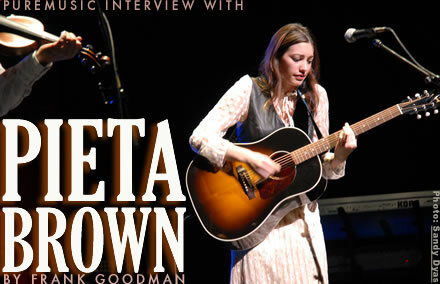 As many know, Pieta Brown is the sublimely featured offspring of folk legend Greg Brown, a trailblazer of his generation. 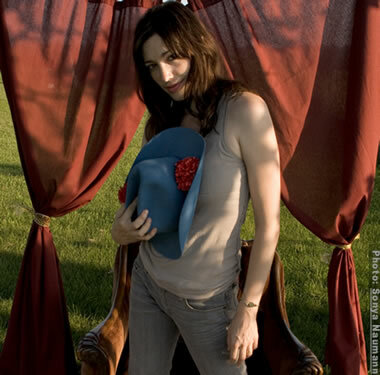 When she threw her stylish hat in the ring in 2002, she was as full blown as she was unknown. She'd been writing poetry for years, but the guitar was relatively new; but I wouldn't have known if her partner in crime Bo Ramsey hadn't said so, because he knew it would surprise me. The Duke of Spook, as we like to call him, has been a huge part of Pieta's records. His cinematic, atmospheric approach to the guitar was the perfect companion to her deep and languid vision. Remember the Sun is Pieta's newest and her best record, on the One Little Indian label. She's reaching higher as she digs deeper. And she has spread her arms and her concerns ever wider. Even her melodies are more embracing, more world engaging, notably on the closing title track. The artist herself plays signature acoustic and electric parts, even some slide on this record. The stellar guitar of Bo Ramsey moves slowly, tremolos and hangs through her recordings like the play of sunlight and shadow. Keyboards on this record play a subtle but big part, both the artist on Wurlitzer and Ricky Pierce on B-3 and more. The addition of David Mansfield on violin and viola brought a few songs to an entirely new level. Jon Penner on bass and Nashville's A team drummer Chad Cromwell created a profound pocket for the proceedings. Like few artists can do, Pieta makes you love more than her music, if you hear it. She makes you love her, and where she's coming from, because it's real. There's no posture and no pretense, there's no positioning. Raised very humbly in Iowa and then in Alabama, she is a rare person who has seen and felt a lot and has found a way to share it that is soul stirring and cleansing. She's on the short list of our favorite artists. Listen to her speak, now, in a recent conversation.